Here at the Lime Hollow Center for the Environment and Culture we take pride in offering programs which allow participants to be a part of a larger whole, and to be embraced by ALL as a member of our outdoor education family. To us, including every person in our programs means being accepted and appreciated for who you are as well as being a valued participant in our program regardless of ability level. Lime Hollow staff are committed to welcoming people of all abilities to our programs by providing appropriate supports and accommodations on an individualized basis. Administrative and program staff trained in the skills and philosophy of physical, social and emotional inclusion. The resources of an agency Inclusion Coordinator for our facilities and public programs. Accessible bathrooms and educational facilities; accessible parking spaces at the Visitor Center and the Education Center. A Trail for All that offers a short natural surface relatively flat trail that leaves directly from the Visitor Center. Service Animals: Service animals are allowed in all public areas of Lime Hollow Nature Center. Additionally, we have a pet friendly pathway which starts at the parking area on Gracie Road, across from the Education Center and follows the Lehigh Trail to Lime Hollow Road. If you have any questions regarding the use of service animals at Lime Hollow please call our Visitor Center. Personal Care Attendants: Personal Care Attendants can attend Lime Hollow camps and programs free of charge when assisting a person with a disability. Motorized Mobility Devices: Personal mobility devices are allowed in all public areas of Lime Hollow. However, for guest safety, only certain devices may be acceptable for use. Please call or stop in to the Visitor Center with questions. 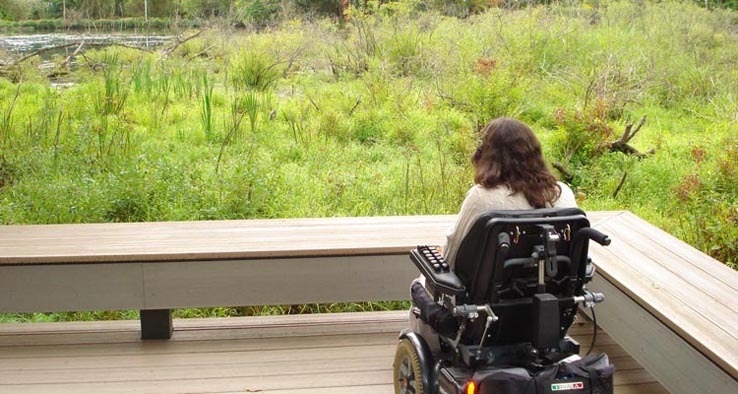 An all-terrain wheelchair is also available for use at the Visitor Center (at no charge). Accessibility questions? Call 607-662-4632 or e-mail info@limehollow.org. Additionally, Lime Hollow Nature Center staff are committed to welcoming campers of all abilities to our program by providing appropriate supports and accommodations on an individualized basis.